A quick word of warning: It’s impossible to review this book without spoilers for previous books in the series. 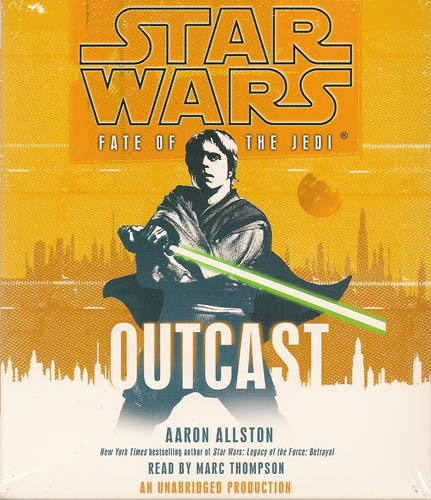 Star Wars: Outcast is the first book in a new series of novels, collectively called The Fate of the Jedi. The series is connected to the previous 40 or so (!) Star Wars books. Here’s a timeline from Random House’s Star Wars page; this series falls on there after the Legacy of the Force series. I appreciate that some attempt is being made at continuity between movies/TV/comics/novels, but I’m not the guy to tell you whether or not it’s working. I do know that the characters aren’t static – Han and Leia are not eternally in their 30’s. At the open of this series, in fact, they’ve got grandkids. To bring you up to speed: Han and Leia’s son Jacen fell to the Dark Side. This happened in the Legacy of the Force series, I believe. If anyone out there can correct me, please do. Stuff happened, Jacen ended up dead, and in the aftermath the Galactic Alliance is wondering if Jedi cause more trouble than they prevent. That’s where we are at the beginning of this book. Now in this volume, Luke Skywalker (that’s Jedi Grand Master Luke Skywalker, thank you very much) is arrested by the Alliance for his part in Jacen Solo’s fall. He negotiates a ten year exile, and decides to use the time to retrace Jacen’s steps in an attempt to understand why he fell. Luke has a young son named Ben who wants to come along, and does. Nothing could possibly go wrong there, I’m sure, since Luke is an expert with the whole father-son thing. And the Force thing. Meanwhile and elsewhere, a young padawan named Valin Horn decides that his mom is not really his mom, but a disguised agent. He thinks his Jedi dad is not his dad, either, so out pop the light sabers. Valin is incorrect, though – his parents are his parents. His padawan mind is being influenced by something outside, like what happens to a lot of teenagers. And we’re off! I’m not sure how many books will be in this series, but this is the first Star Wars series of books that is being released unabridged, so I’ve decided that I’ll give it a go and try to keep up. I’ve got the next book (Omens by Christie Golden) ready and waiting. 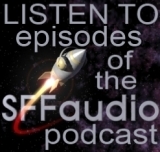 I enjoy the Star Wars universe, and found this to be a good listen. It’s a return to a comfortable setting, with familiar characters Luke, Leia, and Han, yet with enough growth of those characters to make them interesting for additional reasons. There are also a bunch of new characters, but this book lets you know whatever you need to know about their pasts. It’s not difficult to follow. As an adult I find these books entertaining, but with occasional eye-rolling moments that I probably wouldn’t put up with in other books. Example: Valin Horn telling his dad (who Valin thinks is an impostor) that, because of readily available electronic prosthetics, Jedi “don’t feel too bad cutting the hand off a very bad person”. Narrator Marc Thompson, in true Star Wars fashion, recites those occasional awkward lines as naturally as possible. If you enjoy Star Wars, this is more of the same kind of thing and you’ll probably like it, too. It’s entertaining, it sounds terrific, but it’s not groundbreaking.